We planned such a trip to Chicago for Spring 2014 and had come a ways in planning when our CA family [Andrew, Theresa and Zoe] volunteered to meet us there. Cool! [We do foam about these people]. It turns out that Theresa has a sister there, as well as friends. “We settled into the clickety-clack” like Joni Mitchell in business class coach, for which we paid a premium. For this you are guaranteed a seat, breakfast and get all the soft drinks you want. They always lose $$ on me, as I am a heavy drinker. We were both tired “from the excitement” when we detrained in DC. We had a 3 hour layover, so we had plenty of time to get our bags checked, our tickets confirmed, have a lavish lunch at a Mediterranean style fast food, and finally relax in the lounge. 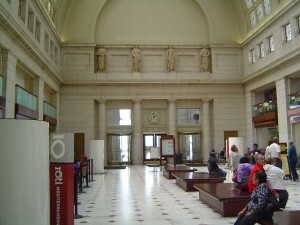 Union Station in DC was designed by the same architect [Burnham] that did the 1897 World's Fair in Chicago. It features larger than life-sized Roman legionaries, some of whom originally were installed naked. There was so much outcry about this that the sculptor fashioned large shields for them to stand behind. We googled this story and learned that from some angles you can see their naughty bits, so we promptly went to look. The Acela Lounge is a nicely appointed room, with free snacks, coffee and soft drinks for sleeper passengers. When they called our train, an official actually walked us all to our train. Our roomette was about 1/3 the size of our British version! It was cute, with 2 spacious “captain’s” seats facing each other [I rode backwards, as it doesn’t bother me at all]. 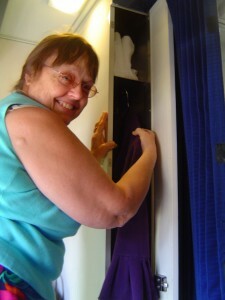 The closet, on my side, was about 6 inches wide, with 2 hangers. Cleverly installed in Ron’s chair was the sturdy step to the upper bunk, neatly forming the sloping ceiling. There were curtains for the doors and windows with Velcro and a sliding door. We could leave this open for more airflow, with the curtains closed for privacy. Our chipper attendant bopped in to ask what time we wanted dinner and our beds made, as well as wake-up. There were 3 Park Service “Smokies” on board in the Observation car to give a “Rails and Trails” talk, but we decided not to go, interesting as it sounded, in lieu of staying in our little den. As we rattled on, we noticed that the Potomac was full of log jams against the bridges, with very high water. This continued as we went upriver into MD and WV, into the mountains, where whole valleys were flooded. Harper’s Ferry WV has become quite the tourist destination and not the sleepy village I remember from my teen years. People were everywhere along the tracks, including hiking and biking on the tow-path of an abandoned canal. 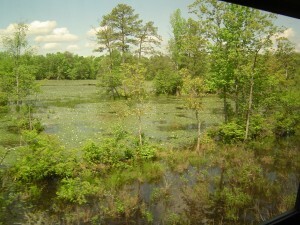 We passed over the Potomac once more, swollen and turgid, and we made our way to the dining car. They call it “community seating” which means you dine with strangers at a table for 4. They had linen on the table and menus with several choices and our meal was included in our fare. The flatiron steak is a specialty and quite good and we chatted with folks while passing through a half-mile-long tunnel—amazing engineering considering it was done in the 19th century. Coming out the other side, we had crossed the eastern Continental Divide [this refers to water flowing towards the west at this point]. Through another tunnel to the Sand Patch Grade had us dropping 1000’ in 20 miles. And through all these miles of track I spotted not a single deer! We had our beds made up at 10 pm and I crawled into the top bunk, now deployed and with a substantial web of belting to keep me there. The bunk was very narrow, though long enough, and I got a few bruises when I brought my knee up to my usual sleeping position. There was not enough height to sit up and it was a trick getting in and out. Ron’s bed was made up of the 2 chairs leaned flat, with a mattress. I accomplished my 2-3 trips down the hall to the toilet fairly well through the night. We had a 6 am wake-up but we were already stirring, ready for our 6:30 breakfast. We were in Elkhart IN at that point surrounded by another enormous railyard with literally hundreds of rolling stock [cars], many of them hoppers filled with white powder [flour rather than heroin, I’m guessing]. Little hills of powder were under the “teats” of each car. We noticed multitudes of these little mountains all along the tracks into Chicago. I guess the rats are held off by the huge iron cats that scream through day and night. We were pleased to see steel mills and other industry along the tracks; the Midwest looks healthier economically that we feared, compared with the northern East Coast cities whose industries have decayed beyond recall. We saw on a passing bank sign that the temperature was 45o! [We left home the day before in shirtsleeves even in the morning.] The fields were plowed but it was not yet spring in the north, as it is in VA. Many of the farms are probably Amish or Mennonite since they look like the ones in PA—tidy, well planned, with enormous houses and barns. Here, I expect they need the barns, whereas the German immigrants in VA found they did not in the mild winters, and those barns can be seen falling down all over. Into IL, we passed the strangest neighborhood. The lawns, streets and sidewalks and a few parks were still there in the familiar grid, but ¾ of the houses were simply gone. Others were boarded up and abandoned. We guessed this area had declined and become a haven for drugs and squatters, and that, as the houses decayed they were pulled down leaving only concrete pads. A very few intrepid souls now live in a rural area—very weird vibe. We pulled into greater Chicago. Glancing out, I saw a sailboat seemingly on the next tracks over [!!] but in fact the train tracks were crossing an inlet of Lake Michigan very nearly level with it. Into the station on time, claimed our suitcases [off one of those airport type carousels, but the Amtrak person actually checked our claim tags!]. 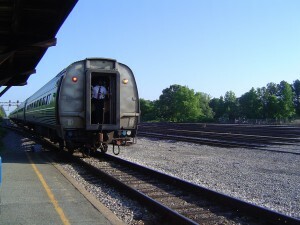 Our ride home was pretty much the reverse of this: same tiny roomette, but on the upper level this time. We boarded around 4 pm, having made dinner reservations in the Metro Lounge. Same steak dinner. Same shaky restless night. However, for reasons non-too-clear, the bozos didn’t leave the station in Chicago on time, which meant we missed our window on the tracks. As you no doubt know, being intelligent enough to read my blog, the private freight train companies own the tracks; Amtrak and metro lines lease time and space on the tracks. Therefore freight trains get priority, as they are often carrying live cargo or fresh produce. So when we missed our window, we missed it all night and spent a lot of time on sidetracks and pulled in to DC more than 2 ½ hours late. This caused great panic among one lady at a table near us at breakfast. She was incensed that she might miss her connection to Miami and let everyone, from the waiters up to the conductor that she was unhappy and expected a refund. Nobody really cared, but they were polite; and in the end, we all made our connections, due to that 4 hour window. However, due to our lateness, they gave us free lunch, although they were out of nearly everything at that point. We had salad with a hamburger bun and were satisfied. We noticed the rivers had subsided, leaving all manner of detritus high on the banks. About that time, we reached Harper’s Ferry, where we learned that a kayak had overturned, requiring a helicopter to land on the tracks, which were the only flat place around. So we sat—and sat—but it is impossible to begrudge life-saving. Ron and I made plans for staying in DC if necessary, as the train to Newport News runs once a day every day. But we set off before very long and got to see rescue vehicles, but not the helicopter, which was likely flying the victim to the hospital. We had no trouble in DC and had enough time to retrieve our bags and get our free drinks in the Acela Lounge before hiking to the good ol’ 99 train to home. 1.The Trough is any buffet esp. on a cruise ship where they offer food at all hours of the day and night. 2. Cousin Vinny is any relative who has a sideline, often involving kickbacks. Some Cousin Vinnys will drive you to the airport etc. Upscale Cousin Vinnys have specialty shops that the tour busses call into. These Cousin Vinny stores have bathrooms and sometimes free samples. 3. CTC is cheap tourist crap. Such stores are sometimes Cousin Vinny stores. 4. A “foodie” is someone who loves food and knows about cooking it, whereas a “foamer” is usually used in connection with trains, and means one who loves locomotives and cars and knows all about them personally, by name and number, and are foaming mad for trains in general. 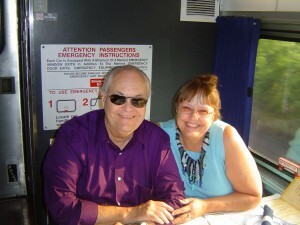 Ron and Carol like trains very much and love to ride them, but we are not foamers. Our website www.bucklesfamily.net shows pictures and has a sign-up for our guest room.